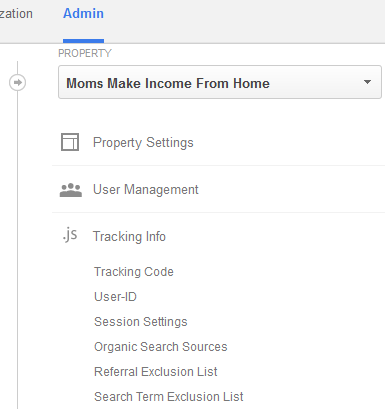 Learn – Use Google Analytics - Moms Make Income From Home! This platform will collect data on your website and will then provide you with reporting and analysis to help you plan and organize your business. It will give you the ability to know if you should be making changes to your site based on the success or failure of your keywords, traffic, and conversions. Don’t go crazy trying to look at everything and use it all. It is best to focus on several key metrics to set up your important goals and then use that data to score conversions . 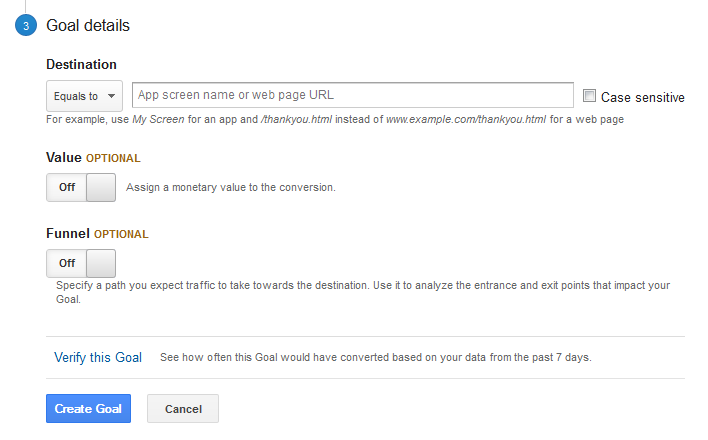 To get set up with Google Analytics all you need is a Google account (Gmail account) and the URL of your website. To easily set up your account click here. Once you have an account setup up, you need to edit the permission on your account in order to set up a property (website). To do this go to your Analytics account, click the Admin Tab, look in the Account column (left column) and make sure your web site is showing in the drop down box. Now go to the Property column (middle column) and select from the drop down box Create New Property. On the new Property screen, choose Website or App and then the Name of the Property. Next you enter your Website URL. Select an Industry Category and your Reporting Time Zone. Click on Get Tracking ID. Now your property has been created! To find your tracking code, go to the Admin tab and you will see in the center of your screen Tracking Info. Click on Tracking Info → Tracking Code. This code is very important and should never be altered in any way because you will lose the ability to have data collection on your site. You should only use it to copy and paste for tracking purposes. The Tracking Code snippet is in a box. It starts with <script> and ends with </script>. 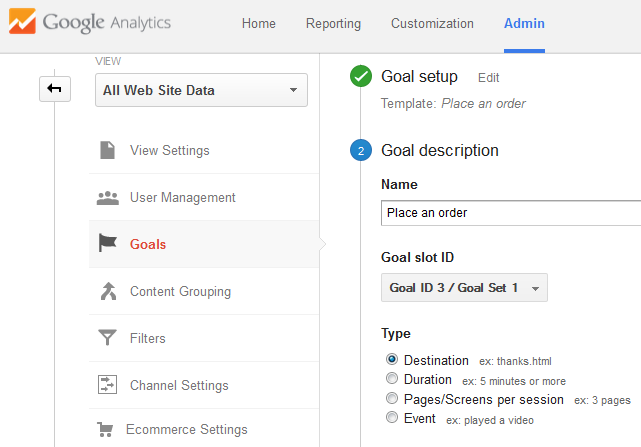 This is how to install Google Analytics for WordPress. Copy the entire code. Now go to WordPress where you should be signed in to your website. Go to Appearance → Editor→ Header (on the left side of your screen). 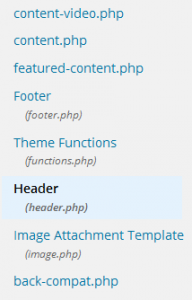 Choose Header (header.php). Do not make any changes here except for pasting the Tracking Code. Go down in the Header page until you see <head> and </head>. The Tracking Code should be pasted between <head> and </head>. Can Google see your site? Your Tracking code is now in place. Allow Google about 24 hours to start seeing your site. Go back to your tracking code in Analytics and check the status until you see Receiving Data in the status line. In the mean time, you can start setting up your goals. Your goals are used to measure your websites effectiveness by tracking conversions or actions on your site. Revenue – This would be used when someone makes a purchase on your site. You can also specify a funnel to capture the steps taken and even drop out points. Acquisition – This would be used as a duration goal, a page count goal, a destination goal, or an event goal clicking on an external link on your site. Inquiry – This would be used for contact with you. Examples would be contacted your site, read reviews, requested a call back, or a live chat. Engagement – This would be to subscribe to a newsletter, shared with social media, played media, or compared information. Destination – This goal is achieved when a visitor goes to a particular page. Duration – This goal is to track the amount of time spent on your site. Pages/Screens per session – This goal is used to set an amount of pages that you would like each visitor to go to. The more pages they are visiting the more interested they are in your site. Event – This goal is to track a specific event like watching a video. Destination – This is the destination goal page. For instance if you set up a goal for a reader to read a review, the destination would be the URL of the review page. Duration – This is a goal in hours, minutes, and/or seconds to reach your time goal. Funnel (Optional) – If your visitor has to go to several screens to complete the goal, you can use the funnel to track their path. As your visitor makes their way through the path, you can use the funnel to track the entrance and exit points that impact your goal. Value (Optional) – You can set up a Monetary Value with the conversion to reach your dollar goal. Category – This is the name that you want to give to the objects that you are tracking. Action – The type of action for the category. Opt_Label (Optional) – This is used if you want to set up additional description text. Opt_Value (Optional) – This is used if you want to set up a numerical value. Opt_Noninteraction (Optional) – This is used as a True answer (after the interaction, do not include in the bounce rate) or as a False answer (after the interaction, do include in the bounce rate). 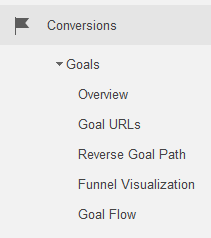 Once you complete the Goal details, click verify this goal to see your goal conversion in the past 7 days. Then click Create Goal for your final setup to be complete. 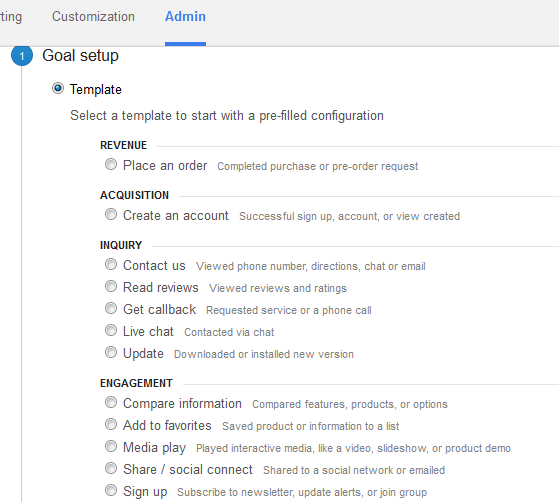 You can set up 20 Goals for each site. Remember that Traffic is important, but what you are really looking for are conversions. To use a shopping analogy, if your shopper is only window shopping and never walks into your store you have traffic, but without an in store purchase or a conversion you have made no income from all your store traffic. 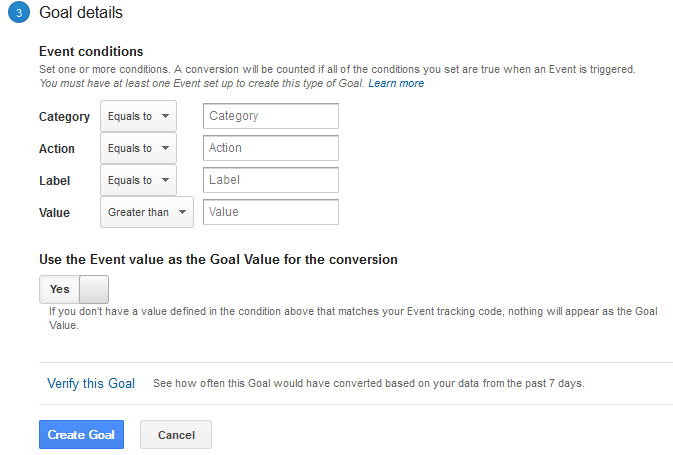 To find your Goals that you have set up go to Reporting→Conversions→Goals. To fully understand your Goals, here is an explanation for each of the tabs. Overview – Here you will see for each of your Goals the Goal Completions, Goal Value (if you have a set value), and the Goal Conversion Rate. Goal URLs – For each Destination Goal that you have set up, you will see the results for that page here including the Goal Completions and the Goal Value (if one has been set up). Reverse Goal Path – This shows the previous pages before completion of a Goal. Funnel Visualization – This shows you where your conversions are coming from to help you understand your traffic and conversions. 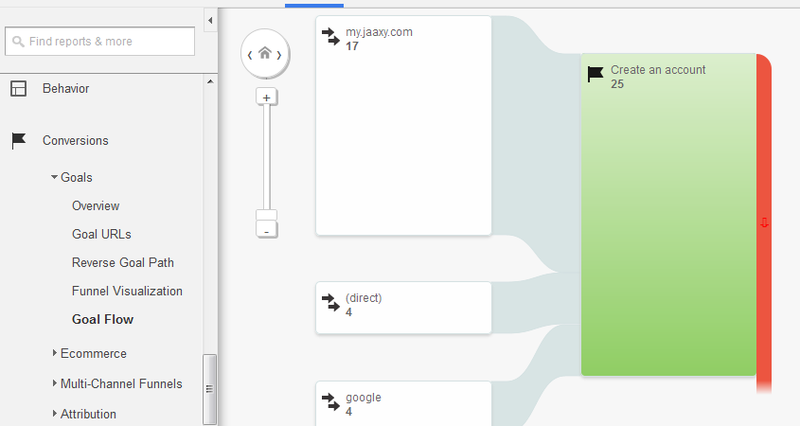 Goal Flow – This will show you the source from where your visitor came from before the conversion. This could be from another site, facebook, direct, etc. You will find additional information on Goals under Acquisition→All Traffic→Channels. Here you will find a break down fore each of your goals under each traffic source by Goal Conversion , Goal Completion, and Goal Value (if you have set one). 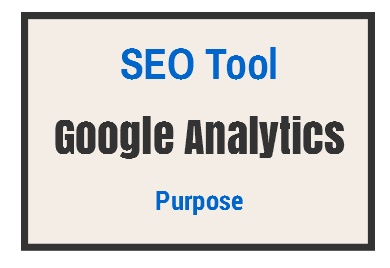 I hope you have found this Post on Learn – Use Google Analytics very helpful. Also check out my latest Review here on the #1 Internet Hosting, Training, and Community called Wealthy Affiliate. If you have any questions or would like to share information with the other Mom readers, please post below. Great! I’m glad it has helped. I think this is one of the most vital informative blogs for me. And I’m glad to be reading your article. Great article on Learn – Use Google Analytics. can join for free and will really jump start your blog. I was recommended this blog! You’re amazing! Thanks! Thank you. Please recommend my blog to someone else. It’s an awesome design of this site with valuable information.